There are certain questions related to life which always keep bugging us, like- Are we alone in this universe? Is earth the only planet that supports life? Our universe is very big and it’s expanding since the big bang, which increases the chances of existence of planets like earth in the universe. We know that water is the basis to life on earth. Every living species on earth needs water for its survival. Recently, we have discovered water on another celestial object and that celestial object is Jupiter's moon, the Europa. Scientists and alien life enthusiasts believe that Europa may support alien life. On 8th January 1610, ‘Galileo Galilei’ discovered Europa along with IO, Ganymede, and Callisto. All these four celestial objects are Jupiter’s satellites. These four are also called as Galileo moons. Out of these four Galilean moons, Europa is the smallest. It is the sixth largest moon in our solar system. Europa is larger than dwarf planet Pluto but smaller than earth’s moon (Luna) with a diameter of 3,100 kilometers. The mass of the Europa is 4.8*10^22 kilograms. It’s made up of silicate rock and surrounded by water-ice layer. Its surface temperature is -171oC. Scientists think that below the surface of the Europa, ‘Water Ocean’ exists. Does Jupiter's Icy moon support life? The distance between earth and Europa is 628.3 million kilometers. It has a thin atmosphere which contains mostly oxygen. 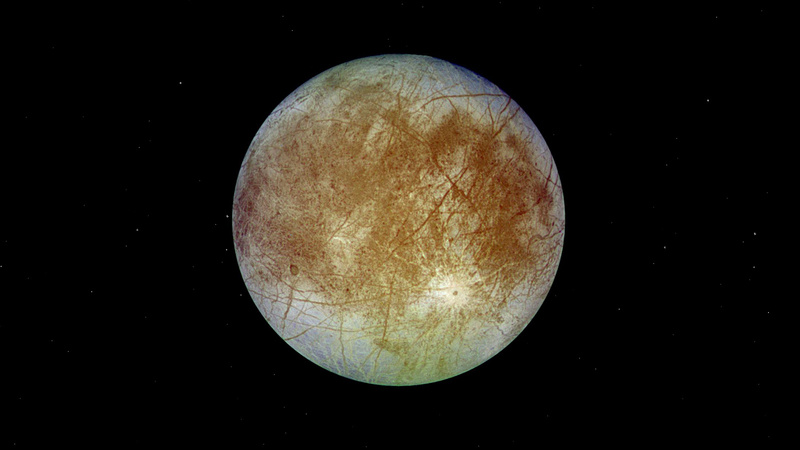 Europa has an icy crust on the surface which acts as a shield for any dangerous radiation. Scientists think that an ocean exists beneath the surface of Europa. This ocean has more water than earth contains. It has active volcanoes which heat water and avoid it from freezing. This water ocean may have exterritorial/alien life because it has all the essential elements which are necessary for the origin of life. Therefore Europa is one potential planet that may support alien life. Exploration of Jupiter’s icy moon began with the Jupiter system flyby of Pioneer 10 (1973) and Pioneer 11(1974). The next two missions Voyager 1(1979) and Voyager 2 (1979) gave some valuable insight about the Europa. In 1995, Galileo space probe was launched. This mission gave strong evidence about the existence of an ocean beneath the icy crust of the Europa. NASA has decided to launch Europa Clipper mission in 2020. The main goal of this mission is to conduct flybys of Europa at closest approach with varying altitude. 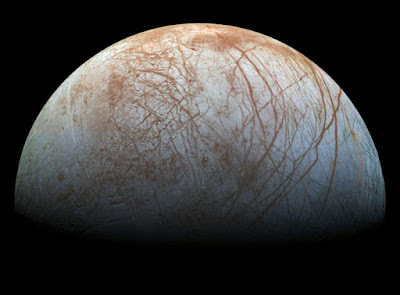 It will investigate whether the Europa could harbor conditions suitable for life. Another mission is JUpiter’s ICy moons Explorer (JUICE). This mission will look for any organic molecules which are important in life-giving process. 1. Jupiter’s icy moon was named after Europa, the queen of Crete. 2. It is the sixth closest moon of Jupiter. 3. Its surface is made of frozen water and is the smoothest surface in the solar system. 4. Radiation level on the surface of Europa is high, it can kill a human being in one day. 5. Europa’s thin atmosphere is because of the sun charged particles that hit its surface. This charged particle breaks water molecules into oxygen and hydrogen atoms. 6. Like earth’s moon (Luna), Europa is also tidally locked with Jupiter which means that same side faces Jupiter at all times. 7. The Hubble space telescope’s image of Europa shows a plume of water vapor erupting from it. 8. Scientists believe that the age of Europa is 4.5 million years which is same as Jupiter. 9. Europa has a light reflectivity of 0.64, which is highest in the whole solar system. 10. To rotate on its own axis, Europa takes 3.551 earth days which means that a day in Europa equal to 3.551 days on earth.